The twentieth anniversary edition of the original Chicken Soup for the Soul is brimming with even more hope and inspiration - the stories you’ve always loved, plus bonus stories, plus 20 bonus stories from today’s thought leaders.Twenty years later, Chicken Soup for the Soulcontinues to open the heart and rekindle the spirit. Celebrate the twentieth anniversary with the classic book that inspired millions -- reinvigorated with bonus stories of inspiration! You will find hope and inspiration in these 101 heartwarming stories about counting your blessings, thinking positive, and overcoming challenges. 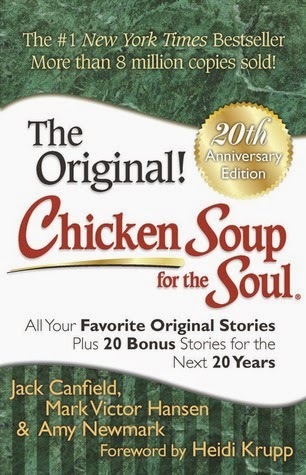 Filled with tons of stories from the original book, Chicken Soup for The Soul 20th Anniversary has got to be one of my favorite books from the collection. Although I've never read the original book, reading the stories that started it all was such a great experience. Not only are these stories inspiring, but they also make you think and look at situations differently to become a better person. Each story is different yet still in the end gives you a similar outcome by letting you know that you can overcome anything and you can do anything you want if you put your mind to it. I also absolutely loved that they added 20 new stories as well to celebrate their 20th anniversary. This is definitely a great book to have in your collection if you're a fan of Chicken Soup for the Soul and if you've never read any of the books before, this is a great one to start with! Disclosure: All opinions are my own. I received Chicken Soup for the Soul: 20th Anniversary Edition at no cost for the purpose of this review. No other compensation was received.